StoVentec Glass facades have been widely used in Europe for years, and are just now being introduced in the U.S. The product works well as both an external rainscreen cladding system, and as an internal decorative option. StoVentec Glass is an advanced ventilated rainscreen cladding system consisting of a glass-faced composite panel, thermal insulation, and sub-construction. The result is an engineered, high performance façade with a sleek, elegant look. 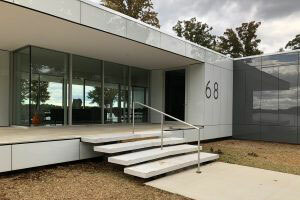 Architect Jeff Davenport, a principal at Perkins & Will, chose such a StoVentec Glass panel system for his private residence on Lake Anna in Louisa County, Virginia. It is the first such installation in the country, and based on the stunning results, will most certainly generate future use of this versatile, highly functional product. The contemporary plan initially called for metal panels, but the contractor on the project, Pillar Construction, suggested StoVentec Glass panels, which would provide better insulation and incredible aesthetics. In addition to the advanced rain screen cladding with a back-ventilated system and air cavities for drainage, StoVentec Glass panels also offer thermal and sound insulation. Part of the Ventec manufacturing process includes the fusion of color onto the back of the glass. The color melts into the glass, creating permanent colored glass panels that will not wear, scratch, fade or incur water damage. Vivid colors and different panel size options are available, offering many aesthetic choices for either new-build or renovation, which you can learn about here.